Derbyshire Times Friday August 29th. 1952. On Sunday (August 24th.) 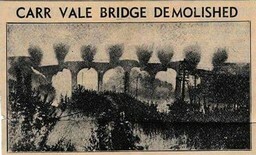 the quiet of Carr Vale village was shattered by an explosion, and when the dust clouds cleared, the valley over which the Doe Lea viaduct carried the old Lancashire, Derbyshire & East Coast Railway line, looked like a blitzed Stonehenge. 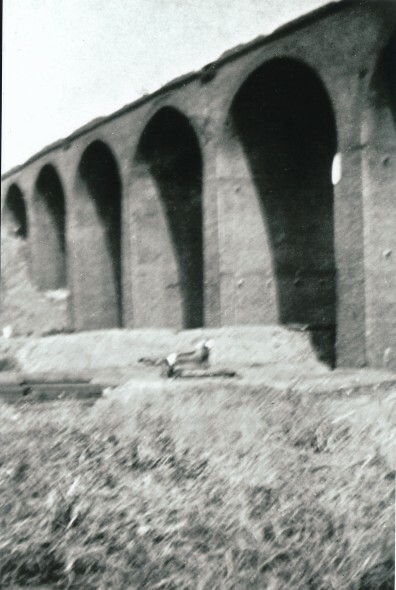 The viaduct, engineering feat of half a century ago, had proved too tough for the big bang planned to demolish completely this 70 feet high. 370 feet long structure of blue brick. Still pointing monolith fingers, at the sky were two and two halves of the viaducts eight piers. 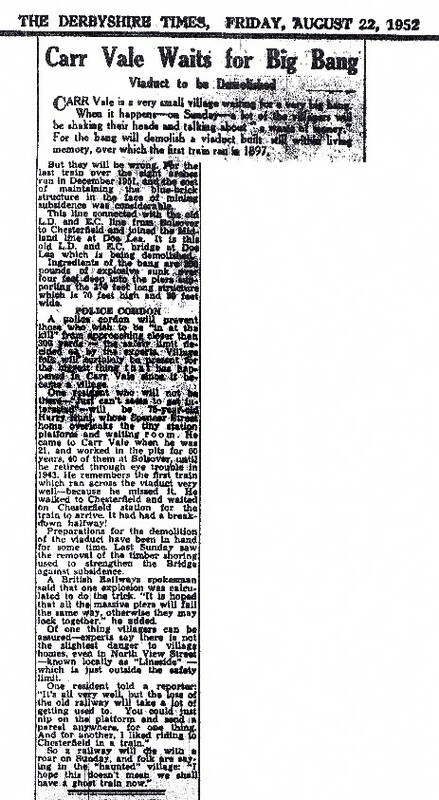 British Rail officials and explosives experts scratched their heads. An hour passed. At 9:50am plastic charges were tied to one of the standing piers. Another flash, more smoke, another big bang........ but the piers still pointed skywards. So two bulldozers were brought along and did what the dynamite could not. Colour photograph Copyright ANB taken in 1999. 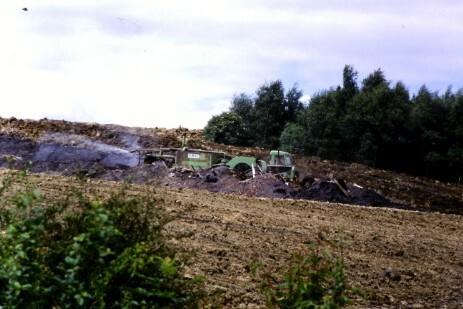 Earthworks to the viaduct enbankment are carried out as part of the Nature Reserve development. Newspaper cuttings from Zoe Hunter from the research for her new book on the LD&ECR. Will transcribe the articles at a later date. Many thanks Zoe. Locomotive Magazine article on LD&ECR. 15/11/1906. Just built and in it's prime. The Engineer. Mrs. Riley and her son Morris. 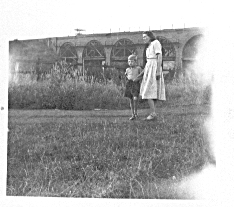 Walk near to the viaduct, prior to demolition, early 1950's. 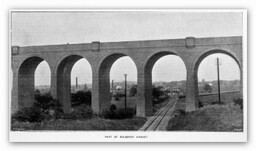 Morris Riley sat on the bridge over the Doe Lea Branch line with the viaduct to the rear. 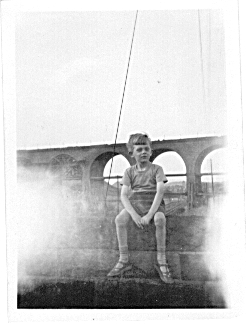 That bridge is still there but the viaduct is long gone. 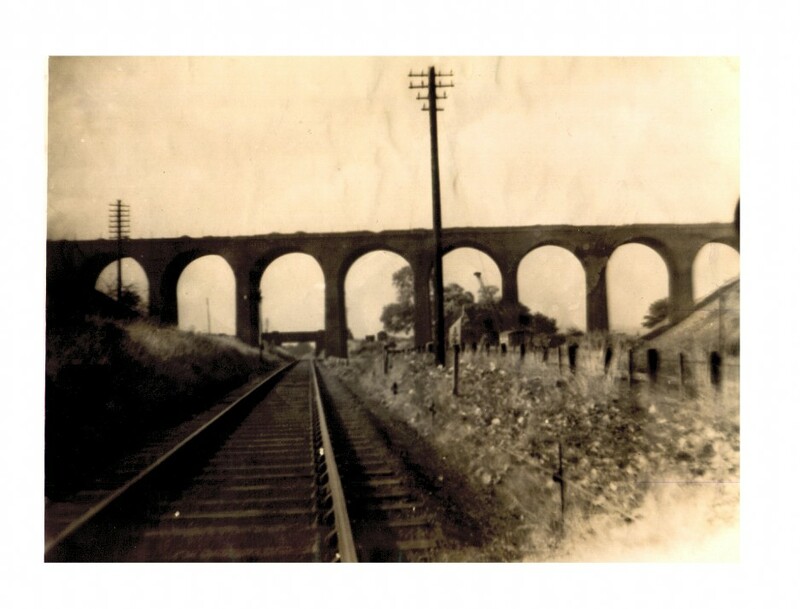 With the viaduct in the background the colliery at Bolsover is on strike or holiday so the ponies come out of the pit for some well earned R & R. 1920's.